"The dog is man's best friend" remains true to this day of modern technology, of robots and computers. Stories of the dog's gallantry and heroism have taken center stage several times making more and more people become "dog lovers". Normally, dogs and other animals, reproduce on their own, but with the surge of demand, animal experts have discovered ways to propagate and breed dogs. Dog breeding has eventually become a viable business. As defined, dog breeding is the process of reproducing a particular type of specie attaining a specific characteristic or qualities. 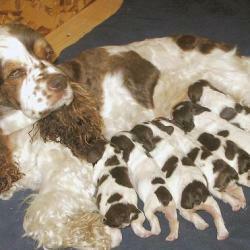 There are generally three types of dog breeding: Inbreeding, Line breeding and Out crossing. Inbreeding is reproducing two dogs with similar lineage, they may either be brothers, cousins or grandfather and grandmother and the likes. Line breeding is the process of propagating species which still have the same lineage but are considered remotely related to each other, they may either be second cousins, nephew to aunt or even grandson to grand mother. Outcrossing is reproducing using two species totally not related with each other, they do not have anything in common, in short, they come from totally different breeds. Dog breeders use this process when they want a completely new breed, usually a better and improved one. Dog breeding is primarily done to bring out the best from all the species and gather them together in one single specie, it's as simple as gathering all the best ingredients in the market to make the best recipe. But the process of dog breeding in itself is not a simple task and cannot be done by just anybody. A professional breeder has to take care of the procedure, otherwise, the end result will not be what we have expected it to be. Basically, a dog breeder considers several factors before proceeding. The quality of the dog is the most essential factor to be considered. The contract type which the dog was bought should also be taken into consideration. Not to be taken aside is the genetics of the dog. It is not enough that a dog looks healthy in his physical appearance, it has to have healthy genes as well. The dog's temperament is a prime pre-breeding consideration, while this is affected by the environment where it lives, temperament is hereditary. Total health conditions, vaccinations and health history are likewise of prime importance. Age should also be considered as dogs have to be physically, emotionally and mentally mature before any breeding is processed. Breeding a dog is pressing and even stressful both on the animal and the owner. It is then imperative to thinks even more than twice before deciding any breeding process. It may take a while, but not being haste makes lesser waste.